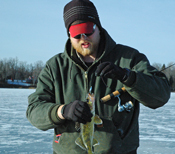 Fishing Report December 31, 2011 Jeff Sundin It's kind of ironic that when you set out to purposely catch a big Walleye, there always seems to be some little complication that works against you. Sometimes the opposite is true, set out to catch "anything that bites" and often times a big one rolls along when you least expect it. On Friday, we had decided to take a break from Walleye fishing and go for some action. Perch, panfish, whatever, anything that bites. After scratching our heads for a while, I mentioned to my buddy Arne, "What about trying Bob's Hole?" Oooh, that sounded like a good idea, we had a notion that the Perch would keep us busy during the day and maybe a Walleye or two would wander in just at sunset. I got in touch with my friend Matt Mattson, set up the time and by the time we arrived at the lake, Arne was already out on the ice. As we got close, I could see that he had something flopping around on the ice, a good sign. We stopped at the spot marked in my GPS and started drilling some holes of our own. It took a few tries, but soon, we found the breakline along the edge of a large, shallow flat. The first time I found 8 feet of water, I dropped in my Flyer and within a couple of minutes, I had one Walleye and one Perch laying on the ice. By now, I'd checked in with Arne, he had iced a Walleye too and it looked like we were on Green for go, except for one small problem. That was the end of the action and from now on, we would drill lots of holes and watch lots of fish come in, take a look at our lures, then swim away. Few, if any took the bait. The more holes we drilled, the more we became convinced that our original starting point was good, but that we just needed to wait for the "evening run". Even at dusk, the fish didn't get overly cooperative, but they did at least move in a little bit and we caught enough to send home with Matt for a fish fry. For Arne, fishing got better though, pulling big Walleyes out from under the ice has a way of making you forget the slow times and as usual, Arne Danielson was jigging patiently when he noticed that he had a follower on the screen. After Arne said a few sweet words to entice the fish to come closer, he took one last chance to quiver the jig and then, WHAM! The fish finally gave in to Arne's superior jigging style and the fight was on. What about the Perch? To our dis-belief, they never showed up in this bay today. In spite of the great, past track record, Bob's hole wasn't going to be the cure-all for this trip. What we did notice, the fish were there, in the area, and if we kept rotating holes, It never took more than a few minutes to see something on the flashers. The closest thing we had to a spurt of action was when I started seeing lots of minnows on my screen. Even at only 8 to 10 feet, we may have been fishing too deep, where some kind of quirky, fishy thing had them in a negative mood. There could easily have been more fish located high atop the shallow flat. If the minnows were in 5 or 6 feet of water, it wouldn't surprise me at all if we went back and found the same fish biting like crazy once we pinned down the bait a little better. Fishing Report December 30, 2011 Jeff Sundin Okay, That was a surprise! After spending the past week talking about how there are vehicles popping up on every lake in the area. I was treated to a different point of view on Thursday. Heading out on my ATV from the public landing at the South end of Trout Lake, near Coleraine, MN, I was bound for one of my favorite shoreline points in Rydgerg Bay. As I approached the bay, I saw a patch of rough ice and stopped to take a closer look. About 300 yards North of the rough patch was, you guessed it, open water. Not just a little open water, lots and lots of open water. In fact, it looked like the open water covered more than half of the large lakes mid-section. If you happen to be heading that way later this month, keep in mind that there's going to be a huge variation in ice thickness and make a point of not traveling the middle section of that lake! Greg Clusiau, Jason Green, Anita Williams and I had planned another attempt to capture some large Walleyes on Film. The open water didn't do a lot to help us succeed in our mission. I couldn't get to my area, so for the second day in a row , it was time for plan B.
Greg had a spot in mind on the South end, a long gravel bar that spanned a couple of hundred yards and was surrounded by deep water on 3 sides. I shifted gears and headed back toward them. The setup was really nice, Jason had the East breakline covered, Greg had the West, Anita and I had the North point surrounded with holes in anywhere from 19 to 34 feet deep. Okay, it was 4:00 PM and everyone was set up, and now we just needed the fish to move in. Hmmm... maybe we brought too many cameras? We had some lookers, but no matter which bait we tried, the only fish that fell for any of our tricks was the single Walleye that Anita hooked at about 5:30. She eased it up from the bottom, got it into the hole and just as I reached in to pick it up, it managed to get it's head turned back down, shook the hook and slipped out of my fingers. There ya go, close but no cigar! For me, I'm going to take a little break from the search for Mr. Big and gather some fish to eat. After I wait around for that big Brown truck to deliver my special package, My pals Matt Mattson and Arne Danielson are heading over and we're going to spend the afternoon putzing around somewhere. I don't think any of us cares where or what we're fishing for, as long as we're outside! "My Father once told me if a quarterback touches the football, he should be able to catch it. While I realize this is mostly ‘fantasy thinking’ the same concept came quickly to my mind while fishing on Trout Lake today, December 29, 2011. I received a text message stating that the ‘fishing boys’ were drilling holes in ten inches of fresh ice on Trout Lake and would reserve a spot for me. Fifteen minutes after leaving work I was standing on the frozen lake staring into a hole eight inches in diameter. Clouds filled the sky and cast a grey blanket on everything. Bare trees proclaimed their majestic heritage along the shoreline. Fresh, glittering snow did not stop the slipping of my boot as I stepped off the four-wheeler and onto the ice. I made a mental note to get some ice cleats for the next ice fishing adventure as I straightened my body. I let down my bait and listened to the expert instruction from my guide. “Let your bait touch and hold closely to the bottom” he continued “wiggle your minnow just enough to entice, but not scare away your walleye”. I did as I was instructed with great anticipation. I took a deep breath and soaked up the glory of a Northern Minnesota Lake. Time did not seem to exist for me except for the darkening of the sky signaling dinner time. I felt a bump and my entire body came to full alert! That familiar signal of a walleye hit. I lifted my pole and simultaneously reeled down toward the hole. My guide instructed to keep the tip of my pole centered in the pool of water and keep reeling. I saw that beautiful walleye! My guide reached for the fish as I kept a steady line on him. My heart was beating like a race-horse nearing the finish line. Hands aged by thirty years of guiding, plunged into icy waters as my walleye turned to show his white belly and flip his tail to gain just the right momentum to release him from my hook. Sundin hands were on my fish……so close to scoring a walleye touch-down, so close….and yet so far. Tonight would be Christmas dinner left-over ham dinner instead of fresh fish. I have a certain spring in my step and a glow upon my face and am blessed to experience that familiar bump on the end of my line. Thank You Jeff Sundin!" (12/30) On Lake Winnibigoshish, Tom Crosby checked in after his recent visit. Tom stayed at the South end of Winnie and fished mainly along the shoreline breaks in the Solutheast corner of the lake. They fished Tuesday and Wednesday enjoying good fishing for Jumbo Perch. Tom said that they managed to get 75 keepers for the return trip home. As a bonus, they picked up some nice Northern Pike too, most of them between 4 and 8 pounds. Walleye fishing wasn't as good, but they did pick up a few. They reported 13 inches of good, solid ice, but added that no large vehicles were spotted on the ice. (12/30) On Lake Winnibigoshish, Kim from Highbanks Resort said that an ice ridge has formed out in front of the resort. Today, is their official "opening" day, but they will only be allowing ATV's as they give the ridge some time to settle. Updates will be poted as available, or you can call them at 800-365-2560. Fishing Report December 29, 2011 Jeff Sundin On Wednesday, I had hoped to put together a short video with my friends from UpNorth. I've been itching to find a way to satisfy my craving to catch a monster Walleye through the ice, and to do it in my own home territory. Somehow though, this year, there's always been one last detail, one little glitch that sends the game plan into a tail spin. Yesterday, everything was going according to plan, the timing was good, our gear was all in order and the team was all in right place at the appointed time. I had the perfect spot in mind too, an afternoon visit to the "Lunker Hole" surely would produce the desired result, we were on our way, except for one small problem. I was cruising accross the lake, making my the way toward the GPS coordinates that would put us on top of the big ones, when I came to a pressure ridge. Yes, Matthew, I remember what happened the last time we tried to cross one and that's what stopped me in my tracks. I walked out to have a closer look at the ridge, but when I got within about 50 yards, I could already see the water boiling around in the small holes. Okay, if we had more time, we could have gone back to shore and found another way around the road-block, but with only an hour to go before sunset, it was time for game plan B instead. I, Greg Clusiau and Blake Liend compared maps on our GPS screens and came up with a couple of inside corners on a large, shallow flat that drops off into deep water. We drilled holes along the breakline in 24 to 32 feet of water and hoped for the best. On this particular occassion, our best was none too good. All of us had at least a few fish move into our territiory, but except for one that Greg hooked on a Chubby Darter and the Pike that snipped Blakes line, the sunset came and went without giving us our trophy. This time. There are a half dozen lakes in our area that could produce the fish we're looking for, so we plan to keep trying until we figure it out. Today, after spending some time chained to my desk, Greg and I plan to hit the road again, this time a little earlier and try a lake where the window of action might occur a little bit earlier. Finally, If you're planning an ice fishing trip, conditions remain ideal! With no snow cover and lots of good, clear ice, traffic in the Itasca area is at an all time high. Until we get more snow, travel by ATV is ideal. Any trail, any road and any public landing in the entire area is wide open right now. Remember to bring cleats for your boots. The ice is extremely slick and with cleats, you'll find yourself crawling on your hands and knees. (12/29) Bemidji Lakes Area and NMLOG Member Ryan Klein, Says that his rentals on Upper Red Lake are producing consistent catches every day. With most shelters full, the average daily catch is about 20 Walleyes per house. Right now the action is out at 12 to 13 feet of water and best times for catching are sunrise and sunset. 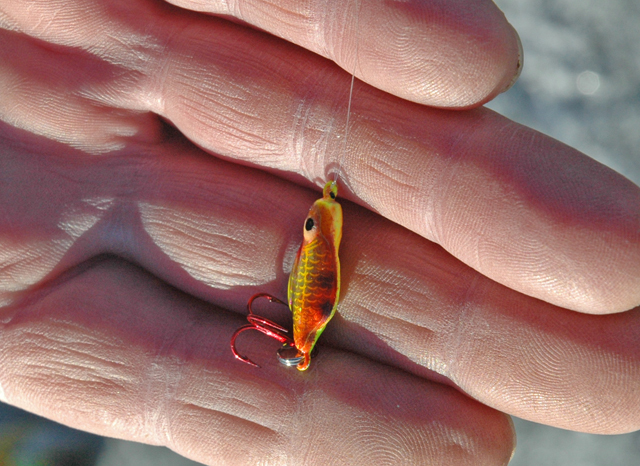 On a recent trip to Upper Red, we had oour best luck on jigging spoons, the best one was the Glow Red Rattlin Flyer. We also had a great run of fish using the Slick Jigs in 1/8 ounce, tipped with a whole minnow. (12/29) On Cass Lake, a note from Steve Ballou at Break On The Lake Resort says that multi-species action has been good in Allens Bay. Steve says; "Spearing action on the Bay has been good in the 6 to 8 ft. areas with water clarity very good." Some fisherman are also angling from shacks in the same territory and catching a mixture of Bluegills, Crappie and Jumbo Perch. An occaisonal Walleye finds its way into the shallows too, but there are more Walleyes moving in the 12 to 15 foot range along the shoreline breaks. Walleye action is best at sunrise and sunset. Steve wrapped up by saying that "Ice conditions on the Bay are good clear ice from 12 to 15 inches and vehicles are driving in the Bay." Fishing Report December 28, 2011 Jeff Sundin I was thinking of a way to combine a little family fishing trip with a few chores that I'd promised to do for a friend and decided to take the day on Tuesday to make a run up North and help find a location for his new fish house. When you're ready for some action and a great fish fry, Jumbo Perch fishing is always a great plan. On Tuesday, our crew was hoping for a mult-species spot and kept that in mind as we headed for the lake to set up the permanent ice shelter. It took a little while to get the bugs worked out of our system, but we did eventually figure out how get the house moving on the ice and out to an area that I was interested in trying. We drilled holes up onto the top of two adjacent humps and then added more holes in the deep water between them. Before we decided on the final destiantion for the shelter, we spent a couple of hours fishing around the area to see if there was a "hot spot". As it turned out, there was an area on top of a deep, soft-bottom hump that was holding some nice Perch. The hump topped off at about 26 feet and was surrounded by 35 to 40 deep water. There was sand up on top and soft mud beginning at the lower edges and continuing out onto the deep flat. It was holding mostly Perch, bu at about 1:30 PM, Austin picked up a nice "eater" Walleye. That was enough encouragement to make us begin to focus on that location. We still didn't set up the house, but we started the heater and began using it as headquarters as we branched out to explore around the area. A lot of drilling, a little walking and a bunch of fishing holes later ..... We had found a handfull of fish on the upper edge of the second, shallower hump. They were holding at about 18 feet and there was enough action to keep it interesting. The problem was that a bunch of small Northern Pike were also using the area and I got tired of letting them snip off my prize collection of Slick Jigs! I was losing the war, one jig at a time and I started thinking that those Perch out deeper were looking pretty darn good. So, the Perch hole became the final destination for the day. We continued to fish some of the other holes too, but the action in the house was equal to any other place we tried. The best presentaion for the Perch turned out to be dead-sticking blade baits tipped with whole minnows. Something like a Frostee tipped with a tail hooked minnow and fished almost motionless about six inches above the bottom. In fact, I think the one rigged up with a bobber was just as productive as any other bait we tried. The Glow Red color was good, so we didn't really try many others. I caught a few fish on a Rattl'n' Flyer too, but the fish weren't interested in anything moving fast. I had to fish this bait very slowly, just barely wiggling the rod tip to trigger a strike. Today, the kids have to go back home and the idea of getting back over to the lunker hole is creeping back into my mind. Unless something goes topsy turvy, I feel an afternoon bite coming on! 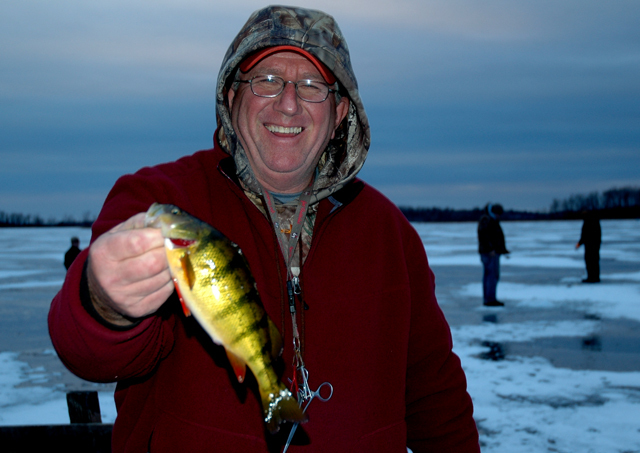 (12/28) On Lake Winnie, John Seekon from The Pines Resort & Campground Told me that the Perch fishing action is heating up on their side of Lake Winnie. John said that there's already 16 inches of ice along the shoreline in Tamarack Bay and 12 inches out in the middle section of the lake. Perch fishing has been good in water depths of 12 to 13 feet and the best action occurs in the deep weed beds found in the bay. Jigging spoons and blade baits are producing good results, with green, red or white on top of the favorites list. He added that some sorting is required to get a bunch of perch between 9 and 12 inches. The Pines hasn't officially started travelling by vehicle yet, but there are full size pickups moving around in the bay. (12/28) On Ball Club Lake, Gus Sheker from Gus' Place Resort Doesn't have a crew in yet, but fishing reports are in the near future. Gus says that conditions on Ball Club Lake are mixed. On the shallower, South end and out in front of his resort, there are currently 10-12 inches of ice, with virtually no snow cover. There are a few light trucks beginning to move around on the South end where the ice is thickest. There are as many as 2 dozen light weight fishing shelters on that end of the lake too. Along the West side, there are some dark houses set up, but there aren't any vehicles travelling near the deeper water. In fact, Gus said "It seems early in the season to me but, there is a significant pressure heave running north and south down the middle of the lake." No matter how you lan to get around, you'll need to explore for a way to safely get around the pressure ridge. As always, a safety reminder, the ice thickness varies throughout the lake and all fishermen should use caution. (12/28) On Lake of the Woods, In spite of a mild slow-down in the action over the past few days, Lake of the Woods continues to be the big news around Nothern Minnesota. Jacki at Sportsmans Lodges starts off her report with; "Many excellent and over the top action days! 50-100+ fish per days, not bad, not bad at all! Some of the best fishing we have seen in years!" " We are seeing about a 60% sauger and 40% walleye ratio right now. The best depth has been in 22'-27' of water just outside of Pine Island. Stop signs, Buckshots and the glass pink and orange jigs have been hot this week. A little shine to your tackle in our waters tend to really do well. Anglers using Vexilars/Fish Finders have had even better luck. Vertical jigging with a minnow has been the best technique at this time." Ice Conditions: "We currently have 14-16 inches of ice in the areas we travel and fish just outside of Pine Island at this time and still just a dusting of snow. If you plan to venture out on your own please remember, ATV's and light vehicles only are advised at this time and allowed out on the trails and roads." (12/28) On Lake of the Woods, My friends Jason Green and Greg Clusiau were using one of Sportsman's Lodges rental shacks this week and had a great experience. 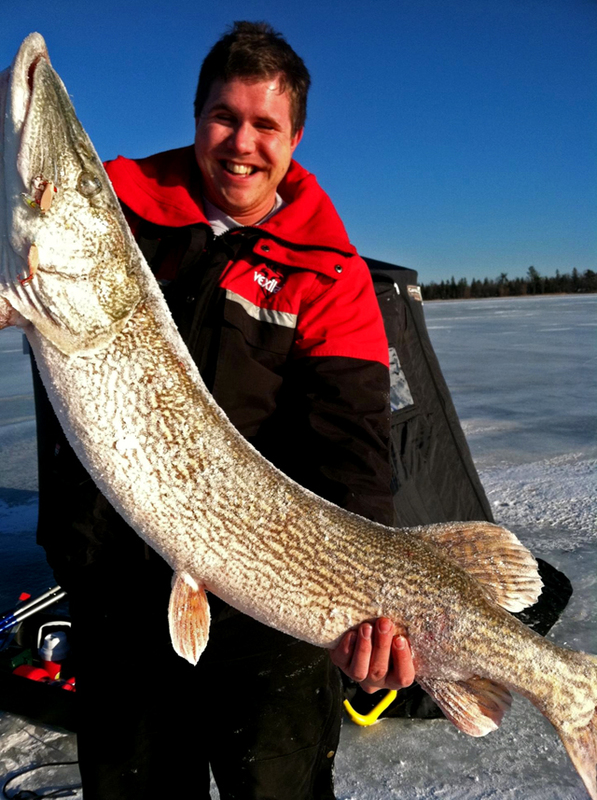 Jason said; "It was some of the best Hard Water Action I have ever encountered." While they were fishing, Greg and Jason had the video camera rolling too. 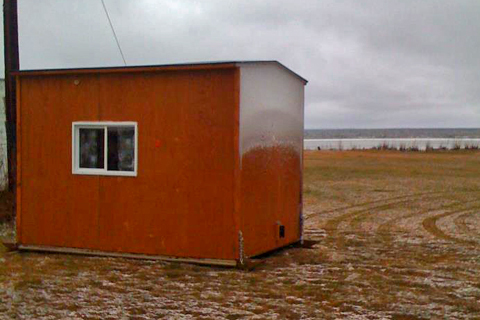 (12/28) We're getting a lot of inquiries from ice fishermen about places to stay on their ice fishing trips. This week, several have asked specifically about sleeper house rentals. To help answer the questions, we're putting together a quick start guide to where folks can stay while they're ice fishing in Northern Minnesota. Here's a down payment though! My buddy Jonny Petrowske treated Matt Careful and me to a day in one of his sleepers on Red Lake earlier this week. We just happen to have a nice little video! (12/28) On Bowstring Lake, Erin at Geiger's Trails End Resort said; "People are driving (vehicles) on the ice now. There is currently only an inch and a half of snow on the lake. The ice is VERY slippery! Geiger's Trails End Resort, on Bowstring is having a small fish contest. Stop in for a cup of coffee and swap a fish story or two. The largest fish, monthly, will receive a prize. (12/28) In case you hadn't heard, here's a couple of the press releases issued by the NPAA about a high stakes Walleye tournament heading to MilleLacs Lake this spring. "A high-stakes, yet friendly competition of epic proportions is brewing on one of the world's premier walleye factories. More than 600 anglers from across the U.S. are expected to compete for over $350,000 in cash and prizes when the Cabela's National Team Championship and Cabela's Masters Walleye Circuit visit Mille Lacs Lake out of Isle, Minnesota, May 31-June 2, 2012." Fishing Report December 27, 2011 Jeff Sundin On most lakes, ice thickness is holding steady at either side of a foot. The existing ice is really pretty! Clear, dark and dense with very few cracks. Due to un-seasonably warm temperatures over Christmas, we didn't get much new ice, but we didn't lose much either. On Monday, there was a little moisture on the surface from melting snow and lots of drilling. Traffic on the lakes is high right now, partly because of good conditions, and partly because lakes to our South aren't frozen enough to be ready for heavy traffic. There are going to be a few changes in ice conditions this week as the weather pattern shifts toward what promises to be a week of below freezing temperatures. For me, the week should be filled with fishing as we have something planned for almost every day. Today, we're planning to help out a close family friend. He asked to me find a good fishing spot and then put out his nice, new, permanent shelter on the lake for some Walleye fishing, maybe panfish as a backup. I stopped and took a look at it yesterday, and it should keep everyone nice and warm. After I got the key for the ice shelter, I ran over to Cutfoot Sioux and caught up with my buddy Arne Danielson who already had a crew on the ice. Jumbo Perch fishing wasn't too bad for Arne and his crew. Fish movement was sporadic along the outside weed edges in about 9 feet of water. Average size was good with fish ranging from 9 to 11 inches. Most of the fish were caught on jigging spoons tipped with a minnow head. I had my best luck using a Rattl'n' Flyer Spoon, but had some luck on a Slick Jig tipped with a whole minnow too. I mentioned last week, but it's worth repeating. 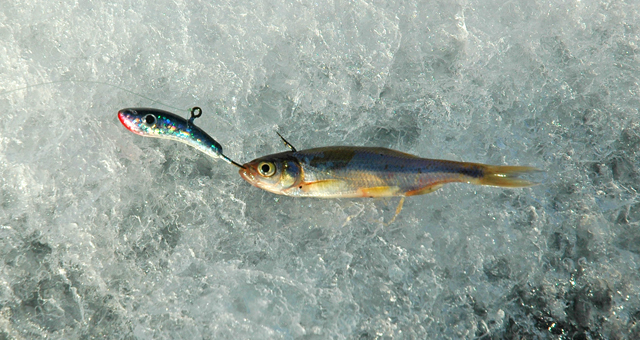 The Slick Jigs (see image) are perfect for imitating a dying minnow. They have a log shape and a heavy nose that allows me to fish the jig with kind of a pounding action that looks like a minnow trying to make it's way toward the bottom. So far, this dying minnow action has produced some fish for me every time out. As I watched the locator, fish would come up from the bottom about a foot, the stop and stare down the bait. The only I could entice a strike was to jig a little until after I spotted a fish on the screen, then once I'd seen it, I had to let my jig sit motionless. Too much action after they started looking and they would run away. I hadn't prepared far enough ahead, or I'd have tried something smaller. Maybe a Toad or Bug tipped with a Wax Worm or small plastic tail would have been better at triggering some of the finicky fish. I'll make sure I have those along the next time we head out there. Fishing Report December 26, 2011 Jeff Sundin Christmas was a great excuse to relax, so I did! We'll be out and about today looking for a great place to put my buddy's new fish house. I'll let you know how that goes and update the reports first thing on Tuesday morning. Fishing Report December 24, 2011 Jeff Sundin Hey, did you notice how much more daylight we had yesterday? YA! The days are definitely getting longer now. In fact, it's only gonna be about 15 weeks before we'll be back on open water. So, if you're thinking about doing some ice fishing, don't spend too much time staring at the calendar. We got a little snow on Friday, but not enough to mess up any plans for the up-coming week, just enough to satisfy the folks who love a little snow on the trees for Christmas. Speaking of Christmas, it's tomorrow and I know that most folks are going to be too wrapped up with that to worry about fishing. So, I might just let myself get a little lazy tomorrow morning and come in late. But, since I was a good boy and finished all of my Christmas shopping early this year, I'm going to treat myself to a little fishing this morning. In fact, I might already be gone by the time you roll out of bed. If anything cool happens, I'll put up a report this afternoon. Just in case this is my last chance ..... MERRY CHRISTMAS! (12/24) In the Deer River Area , Rich Anderson got in touch with an FYI about Deer Lake. He said "people have been out on Deer Lake and even had 4-wheelers haul out a light ice-house. However, just a couple of days ago we had a 4-wheeler go through in 3 feet of water. Everyone was ok, and got waders on and the wheeler out, but be careful out there". Fishing Report December 23, 2011 Jeff Sundin Staying in home territory today and I've got big plans for myself. After I clean up a few business projects this morning, I think I'm going to head over to the "Lunker Hole" and see if I can catch a big Walleye through the ice. The current report for Northern Minnesota hasn't changed a lot over the past 48 hours. There is still virtually no snow cover on any of the area lakes. The back roads and trails are also snow free, so if you've always dreamed about trekking into that little lake, you know, the one that's a 1/4 mile through the woods and down the other side of that big hill, now is your chance to give it a whirl. Conditions will never be better! Crappie fishing in the area is getting more attention now and the fish are cooperative. Most of the lakes with good populations of Crappie are producing good numbers of fish. If you're after a big one and are willing to work a little harder. Smaller lakes with marginal, but fish-able populations are producing better size fish. I got one report from an angler who spent 3 hours to catch 4 Crappies, but the smallest fish was 14 inches. I talked to another friend who spent 3 hours to catch 40 Crappies, but the biggest one was 11 inches. In other words, you decide if you're rather have action or quality and take it from there. Walleye fishing on Leech Lake, Lake Winnie and Bowstring have all been improving over the past few days. For now, plan on using ATV's, or at least have them along as a back up. Anglers are finding their way out into the mid-sections of these lakes, but even where the ice is thick enough for driving, ice ridges are creating dead ends in some key areas. You may be able to drive part of the way, but after that, you'll have to switch to the 4 wheeler or take off on foot. In case it hasn't already crossed your mind, be sure to bring cleats for your boots! The ice is slippery and without the cleats, it's just a matter of time before you wind up on your under-side. (12/23) In the Deer River Area , Bill Powell at Fred's Bait, told me that traffic has been considerably better than last year. Most of that is due to the improved conditions, but it's still a welcome bit of news. Just in case you're planning to fish this weekend, Fred's will be open on Saturday 6:00 AM to 3:00 and Closed on Christmas Day. (12/23) On Lake of the Woods, Tom Neustrom, Minnesota Fishing Connections checked in and said; "Traveling to Lake of the Woods is always an experience of the best of moments. December ice seems to happen on the big lake before other places and that is the reason I continue to venture North just before Christmas. Fishing out of Bayview Lodge on the Wheeler Point Road, Randi Donat and her son Eric offer ice anglers the best opportunity at early ice success and for the last 15 years this has been my destination without disappointment. Whenever I call Randi, she gives a straight scoop and gives me the up to the minute conditions and how the bite is. Fishing this past Tuesday and Wednesday my buddy Kurt Tatgren and I were led out to the 24 foot mark and within minutes we were both tied into rod bending walleyes and saugers. For the 2 days we caught numbers of nice fish and the action was so hot at times we could only handle one rod. Glow red, green and pink spoons with a shiner or a chub head were the ticket and for two veteran guides we enjoyed every minute. 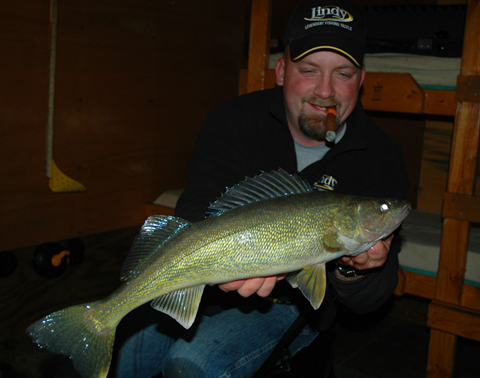 Jiggin Raps were my second choice and some of our biggest walleyes came on Frabill's Dead Stick with a shiner. The bright red colors, marking fish on my Humminbird Ice 45, made dialing into the proper depth a breeze". If you want to experience some fast action for walleyes and saugers in the next few weeks, give Randi ant Bayview Lodge a call at 218-634-2194. It will bring the new year in with a bang. Fishing Report December 22, 2011 Jeff Sundin Maybe it's a reward for suffering through last winter, or maybe it's an early Christmas present to ice anglers, either way, ice conditions are perfect! Today, there is virtually no snow cover anywhere in Northern Minnesota. Overnight temps are low enough to keep making more ice and fishing conditions just keep getting better. I expected to be running my ATV out on Red Lake yesterday, but when I got there, it was a nice surprise to learn that the ice is already supporting vehicle traffic, at least around the shoreline. The ice is probably thick enough to cover more ground than they are, but there are some pressure ridges in the ice that have caused problems for operators who would like to get out beyond them. I met up with friends of mine, Jonny Petrowske and Matt Careful who were planning to work on an ice fishing video. We all had portable shelters and ATV's, but with a cold front blowing in and skies turning Grey, Jonny suggested using one of his nice, warm six man sleeper houses. Oh! Okay! That sounded like a great idea! We were pretty sure that there would be enough fish moving along the shallow breakline that the action would be good enough for the job at hand. It was too, not exactly a hot bite, but steady enough that we easily got the job done. It's funny how we sometimes have a certain game plan in mind, but then the fish shift gears and wind up calling all of the shots. When we started fishing, I had tied on one of Lindy's Rattl'n Flyer Spoons. Within a half hour I had gotten a nice jump on the boys, catching the first 4 or 5 fish on the Perch Pattern Flyer. When the wind picked up and the clouds moved in, everything seemed to grind to a halt. There were still a few fish moving in and out of our locator patterns, but now we weren't getting them to strike. I've had these Slick Jigs burning a hole in my pocket ever since I got them and since I was itching to try them on Walleyes anyway, it seemed like a good time to tie one on. I tied on an 1/8 ounce, Shiner pattern and put on a whole fathead. I purposely kept the jig a couple of feet below the hole so I could see how it worked and while I was still admiring the action, WHAM! A nice Walleye just swooped in a smashed it and for several hours, this was the hot ticket. You can cover a lot of territory around your ice hole with the Slick Jig by jigging and darting it. That's great for getting the fish's attention, but it really turns on when you let it settle back down under your hole and gently wobble your rod rod tip. The jig has a lot of it's weight forward, in the head, so while you're wobbling, it's trying to dive at the same time the minnow is reeling and turning. It looks just like a half dead minnow struggling to esacpe and the fish really like that action. Back in home territory today and after I take care of some business, I'll be looking for an excuse to try the Walleyes on a lake closer to home. (12/22) On Lake Winnie, John Seekon from The Pines Resort & Campground Told me that there are a few anglers on the lake this week. Most reports say that there are 11 to 15 inches of ice in tamarack bay, and 9 to 11 inches on the main lake. 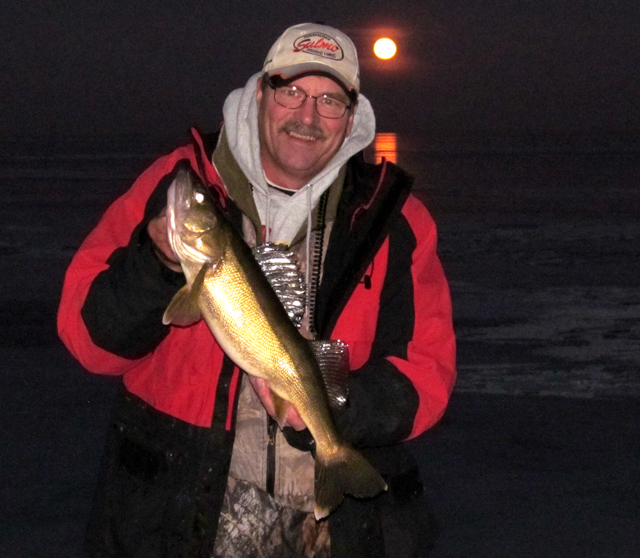 Walleyes are being caught on the mid-lake humps around dark. Perch are being caught in 10 to 12 feet of water in the weeds that are still green. John is expecting to see a huge increase in activity after Christmas. (12/22) On Ball Club Lake, Gus Sheker from Gus' Place Resort says; "On Ball Club, Ice thickness varies throughout the lake with slow, steady ice increase. "We have light weight vehicle traffic, ATVs & snowmobiles, near the shoreline and around the rim of the lake, but the ice is not thick enough for truck traffic and the middle of the lake remains unsafe. 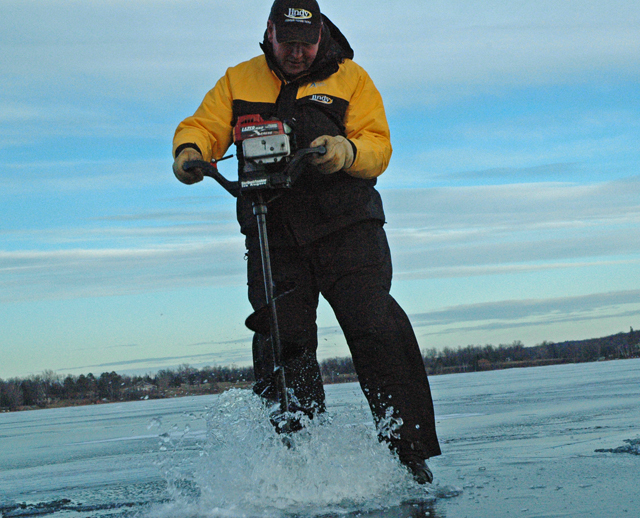 Caution should be used for any lake travel and ice thickness needs to be measured before you venture out on a machine." Gus added that there is no snow cover, so ATV's or hoofing it, with cleats on your boots are the two best ways to travel. Gus said that fishing reports are still few due to the lack of mobility, however fishermen who are willing to walk out are finding nice Perch in 6-12 feet of water. The guys are catching them using whole, live crappie minnows. They're locating the fish by looking for whats left of last summers weed beds, the Green weeds are still holding fish. (12/22) On Lake of the Woods, Mike & Sheila Mayer at Wheelers Point Resort said "The fishing on Lake of the Woods outside of Pine Island has been nothing short of fantastic. Limits are easy to come by, and with a little sorting can be very impressive. The average size of the keeper saugers is wonderful. Limits are often including 15 inch saugers and 16 to 18 inch walleyes. It doesn't get much better! The ice is in good shape here. An average of 12 inches is on the main lake. There are still a couple of cracks to be aware of, so please stop by your favorite resort or bait shop for advice on the latest ice conditions". (12/22) On Leech Lake, A quick note came in from Ron at Anderson's Horseshoe Bay Lodge. The group he had in last weekend had good conditions and good fishing. Walleyes were caught in depths of 17 to 27 feet on some of the humps located out front of the resort. There wasn't a ton of fish, but jigs tipped with Shiners produced enough to keep it interesting. (12/22) On Lake Winnie, Kim from Highbanks Resort says that there are 9-11” of ice, 6 miles out in front of their resort. 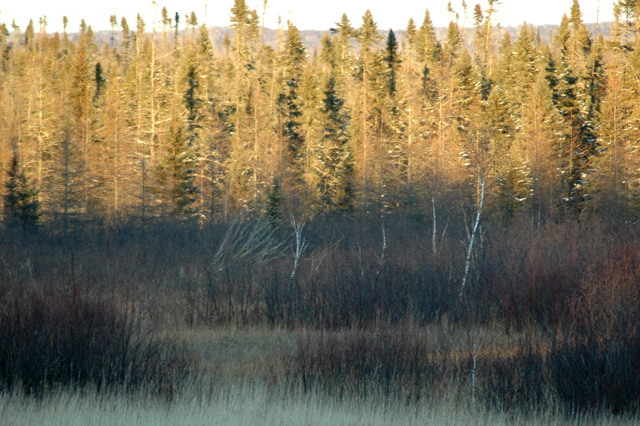 Like all of the area lakes, Winnibigosh is free of snow. Highbanks will be opening for the season on Dec. 30th at 7:00pm. They're running a special, stay 2 nights midweek, get the 3rd night free! (12/22) On Lake Winnie, Doug from Beckers Resort says; "We now have 8 to 10 inches of ice on the main part of Lake Winnie. Some bays have more than that. We are running ATVs at this time. We have no snow. The ice is moving around a bit, so there are several cracks to watch out for. Spearfishing is good, now, in the Mississippi area, Third River and also Bowens flats. Several limits of fish have been seen daily. The walleye bite is good on the shore drops from 13 to 22 feet. The main lake bars are also producing well in the 15 to 25 foot range. The perch bite has been a bit spotty. Deeper fish in the 30 foot range or you can fish shore line weed beds in 4 to 6 feet of water that are still green and get them". (12/22) On Blackduck Lake, Monte from White Birch Resort says "Blackduck lake has 12" of ice and I am driving my Jeep out to the ice house now. The perch are biting but you really need to stay alert and watch your line because it is a light bite. I was out Sunday and caught about 20 but half where only about 8" so they where on the small side. I was using wax worms so no walleye. I did have the camera down and did see quite a few walleye and northern come thru so they are out moving as well. I have my ice house on a 7' to 8' ledge and seem to be quite active for fish. The lake did get a little cloudy the last couple days so there probably was a worm hatch." (12/22) On Lake of the Woods, Jacki at Sportsmans Lodges says; "It has been a fantastic week of fishing here on Lake of the Woods! The bite is active in 22'-26' and the walleyes and saugers are of real nice size. The buck shots and ¼ oz pink and gold jigs tipped with a minnow or just a minnow head have been popular. Those using fish finders like Vexilars have had even better luck. The water has very good clarity and we do not have much snow. We currently have 14-16 inches of ice in the areas we travel and fish just outside of Pine Island at this time. If you plan to venture out on your own please remember, ATV's and light vehicles only are advised at this time. Please check with local resorts before going out as the entire 950,000+ acre lake does not freeze equally or at the same time and it is important to know where you are going." - Merry Christmas Everyone! 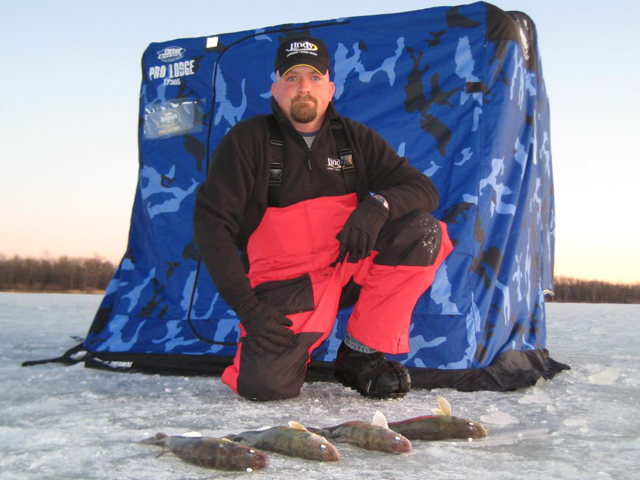 Fishing Report December 21, 2011 Jeff Sundin Perch, Panfish and Walleye action is good right now and ice conditions couldn't be better. Ice fishing shelters are popping up everywhere now. On Tuesday, I spotted dozens of shantys while I was out on a tour of the Grand Rapids area lakes. On Jay Gould Lake, in spite of open water running in the channel and out into the mid section, there were 20 or more shelters lining the shoreline. Darkhouse anglers, Perch and Panfish fishermen all ready to take advantage of the great conditions. Pokegama has frozen solid enough to attract the attention of local anglers and the Walleyes are rewarding fishermen for the effort. I talked with a friend late yesterday afternoon who had just been out fishing on one of the humps on Lake Pokegama. He said he was in a rush to fix his broken auger so that he could get back out on the ice where he and a friend had already caught 3 or 4 Walleyes. For me, the morning today will consist of a nice, leisurely drive up to Red Lake, where I'll be joining Jonny Petrowske, Matt Careful and a few other friends. Jonny P is going to put us on top of a whole bunch of Walleyes and Matt is going to supervise the installation of our Walleye Flyers. After we're done, I might just get my first fish fry of the winter. Fishing Report December 20, 2011 Jeff Sundin Crummy weather to the North and to the South, but for now, Minnesota stays in the "good stuff". Moderate temperatures and good ice conditions should give the local bait and tackle shops a nice boost, just before the Christmas weekend. Right now, the general reports are all coming in positive. If you have a favorite early season lake, chances are the access is good and fish are at least fairly cooperative. Yesterday I mentioned that the Crappie fishing had been making some news. Today, Walleye fishing is getting a lot of attention. Virtually all of the major Walleye lakes in the Northern 1/3 of the state are accessible right now and the fish have been active. Everyone that's been to Lake of the Woods has come home with glowing reports, Upper Red Lake has been producing Walleyes too. Lake Winnie, Leech Lake and Vermillion are all off to good starts as well. So far, most of the fish are located on shoreline related structures. Breaklines into the deep basin edges, points and deep weed edges (when you can find them) are good early season producers. Main lake humps, bars and reefs will be producing fish too and as ice continues to gain strength, anglers will begin focusing more on mid-lake structure. Jigging with spoons and blade baits has been the standard presentation. Lures like the Rattlin' Flyer tipped with a minnow head is a good all-around choice, so are jigging baits. I've been itching to try out the Darters this winter and I'm going to get my chance really soon. For me, the morning today will consist of running in and out of Doctor offices. This afternoon, I hope to follow up on a hot tip for some Crappies. Tomorrow, I'll be taking a nice, leisurely ride up to Red Lake, where I'll be joining Jonny Petrowske, Matt Careful and a few other friends. Jonny P is going to put us on top of a whole bunch of Walleyes and I might just get my first fish fry of the winter. Personal Appearances, Last Thursday and Friday, we fished panfish with an elite group of outdoor writers and photographers. Among them, Jeff Samsel, a freelance writer from Georgia. Jeff spent a lot of time with me as we travelled from spot to spot and he posted a nice column about the trip on his Blog. There's no telling where the rest of the stories will pop up, but I'll let you know as they appear. Click here to view Jeff Samsel's Blog. Fishing Report December 19, 2011 Jeff Sundin For me, Sunday was the day that I'd spot my first truck parked on the ice! A little early for around Deer River, but that's another sign of how good the ice conditions are right now. If you talked to someone from Red Lake, they've probably see vehicles out there already and maybe some other Northern Minnesota lakes too. Ice thickness ranges from 6 inches, to over a foot and with virtually no snow cover, you can pick your spot right now. 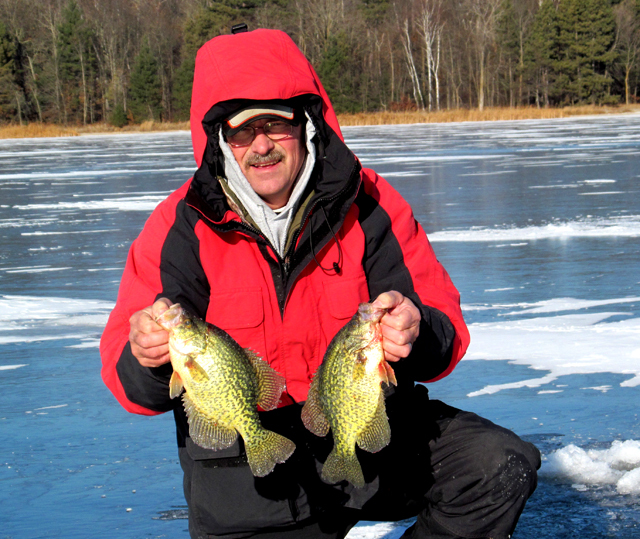 With good ice covering the deeper lakes, Crappies are starting to get mentioned more often now. On Saturday morning, I heard a fantastic report about Crappie fishing on a small lake about 20 minutes South of Deer River. The group was fishing the "evening bite" and the action for fish in the 10 to 11 inch range was fast and furious. There was another great report about a tiny lake located West of Lake Winnie. There, the Crappies were larger and I saw pictures of some fish in the 14 inch range. Generally, Crappies are still located near the areas they were in late fall. On most lakes, deeper holes adjacent to fast breaking drop-offs are the best places to start the search. Crappies will spend another month or more out in these deep, open areas before they start making their way back toward shoreline structures in late winter. On lakes that don't have the classic, "deep hole", watch for Crappies along the deep base of the breaklines where shoreline structure meets the soft bottom of the main basin. It might not seem like structure, but it is. The harder bottom areas along the breaks attract Crappies and the soft bottom area harbor insects for food. On these shallower, dishpan type lakes, Sunfish and Perch will mix with the Crappies too and these can be great places for a mixed bag fishing trip. I've been thinking about last winter and how the conditions changed for the worse. Remember how fast most of us got sidelined by the deep snow and slush? This season, I'm going to cover some ground while I know I can still move around. I haven't decided what I want to try and catch, but I'm going to head out this afternoon and try to pick a place that I can't ordinarily get to. That way, just in case I can't do it later this winter, I'll feel like I fit in some new experiences. 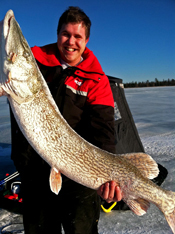 (12/19) On Lake of the Woods, Mike Kinsella at Border View Lodge says; "Fishing has been phenomenal on the south shore. Lots of nice walleyes and saugers are being caught. While the majority of fishermen are in 18 to 24 feet, some are fishing as shallow as 14 feet or as deep as 28 feet. A jig tipped with a minnow has been working well. Color or type of minnow doesn’t seem to matter. There have been some bigger walleyes being caught in the “slot”, with a few over 28 inches being reported. While we have not been getting sub zero temperatures, we are making ice. We currently have 11 to 12 inches on our area of the lake. There is a slight chance of snow this week with lows in the teens and highs mostly in the 20s. We still have some openings this week if you want to get in on the action." Note: Border View Lodge will be closed on Christmas Eve and Christmas Day. 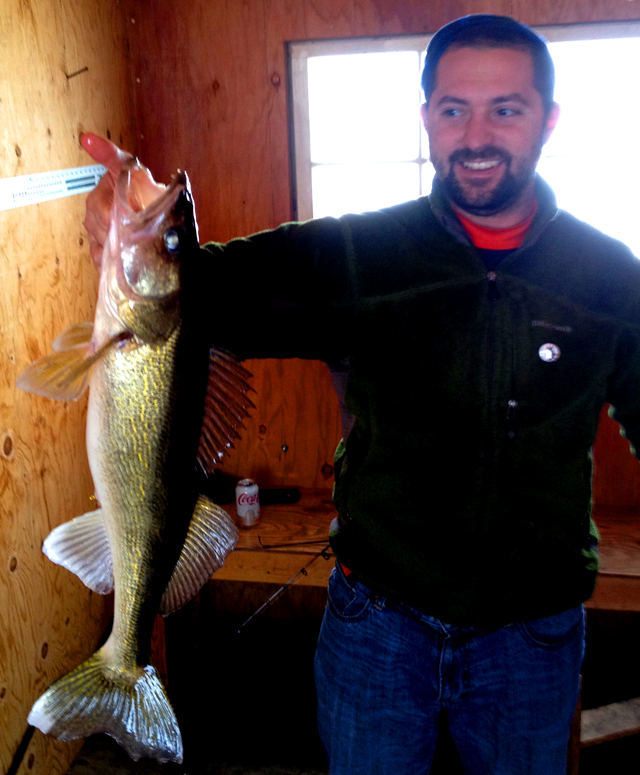 (12/19) On Lake of the Woods, I got a note from Cindie, who echoed the great walleye fishing report. Their group had steady action this weekend. Highlights of the trip included a 28 inch Walleye and a 29 inch with an 18 inch girth, now that is a football! Both of them were released! Fishing Report December 17, 2011 Jeff Sundin Ice conditions just keep improving and the weather forecast seems perfect for making more good ice this week. Right now, ice thicknesses in the Deer River area range from 6 inches on the low end, to over a foot on some of the shallow water lakes that froze early and remained frozen in spite of the warmer conditions that followed. For panfish anglers, conditions are like a dream come true! No snow cover means easy travel to their favorite spots. Back bays of larger lakes or those small lakes tucked away in the woods are easily reachable by ATV or on foot. 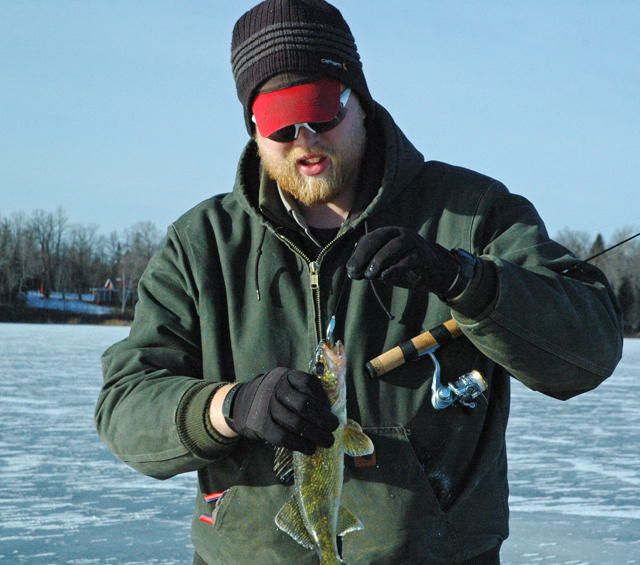 Early ice conditions are perfect for the angler who likes to cover lots of ground in a hurry. In case you're the type of the angler who usually likes to wait a little longer, I think this year would be a good time to consider moving your schedule ahead a little. On Thursday and Friday, we spent most of our time searching for Sunfish. Crappies and Perch were always welcome as a bonus, but the big Bluegills were slated to be the subjects of some really special pictures. The good news, we got the pictures, the bad news, we can't see 'em, not yet anyway. Trust me though, they'll be popping up in the future. Conditions on Thursday were brutal, 25 MPH NW winds forced us to hunker down in places where we wouldn't have stayed otherwise, but we made the best of it and did manage to catch enough fish to finish the job. Friday was a lot better, the weather turned calm, the sun came out and the fish got a lot more active. They weren't all giants, but there were enough big ones to make the day enjoyable and there were more than enough Sunfish to send the crew home with eating size fish for dinner. Early in the week, fish had been holding in deep water, 26 to 28 feet, but by Friday, they'd moved shallower. A large flat that tapered into deeper water held the most active fish. I had my best action in 14 feet, some of the guys were doing well in 18 feet. The best presentation was to pound the jigs on the bottom for a few seconds, then lift the bait a foot or two in order to see if there were any active fish following the lure. If there was, we'd keep working them until they hit, if there wasn't anything showing on the screens, we'd move to another hole. There were a variety of baits that worked, but the Toads and Bugs did most of the heavy lifting. The Green/Black, Green/Pink and Orange/Brown Toads were all producing fish. At about 10 AM I switched to a Glow Red Bug, tipped with a few Spikes and had a really nice run of fish on that bait too. Throughout the day, there had been lots of Perch hitting the small baits. I had a little supply of larger, Slcik Jigs that were burning a hole in my pocket and I wanted to see if I could catch a few Larger Perch. Rigged with a whole minnow, the larger bait helped cut down on the number of small fish and did produce some larger Perch. Instead of catching 7 to 9 inch Perch, I got some fish in the 9 to 11 inch range. 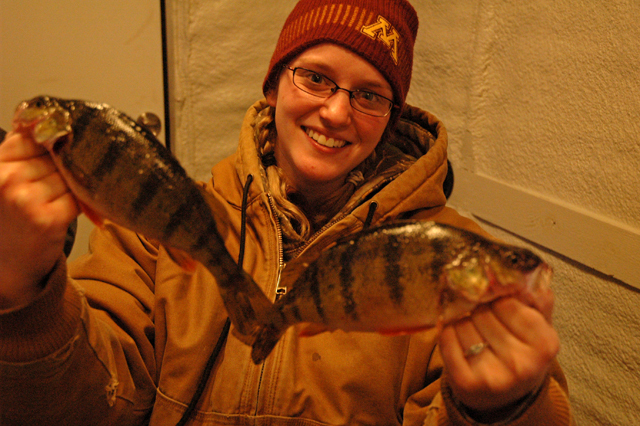 Now I can hardly wait to get out on some premium Perch ice to try them again. Fishing Report December 14, 2011 Jeff Sundin Ice fishing reports from all around the area are generally up-beat! Traffic at the bait and tackle shops is picking up, travel conditions are good and the fish on most lakes have been cooperative. On Tuesday, I spent the day getting my truck and fishing gear ready for action. Today I'll be cleaning up loose ends around the house, catching up on chores and then, later this afternoon I'm heading out the door for my first fishing trip of the season. I had hoped to be updating the fishing reports from the hotel, but I'm having some trouble with my laptop. If I happen to turn up missing for a couple of days, I will get an update posted on Friday night when I get home. (12/14) In the Marcell Area , Terry Schmitz at Frontier Sports says; "We have about 8” of beautiful, clear Ice on most lakes. Early Ice has been good. We are seeing some crappies on Bello and Bowstring. Jessie is getting some walleyes in the evening. Here are some walleyes taken off North Star. Some of the smaller lakes in the area are producing crappies and bluegills. We have everything you need for Ice fishing, Stop in and say HI. See you on the Ice!" (12/14) In the Deer River Area , Bill Powell at Fred's Bait, told me that traffic is picking up at the store. There are anglers heading in every direction now and fishing reports are generally good. Darkhouse anglers on Lake Winnie are enjoying good action right now, so are the Perch fishermen. Folks are just beginning to make their way toward the better, mid-lake Walleye spots, but the early arrivals are catching some fish. There is no snow on the ice, so if you're hoofing it, bring your cleats! Leave the snowmobiles at home, until we get some snow cover, anglers who want to use machines, should bring ATV's. They are the way to go right now. 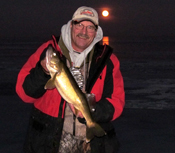 (12/14) On Leech Lake, Ron at Anderson's Horseshoe Bay Lodge says; "The weather here on Leech Lake has been great. Cold at night & making ice. I was just on the lake, could only make it out about 1/2 a mile to 3/4 of a mile on foot. The lake right now is foot accessible made by little snow out on the lake. There is a lot of good clear ice on the lake. 8" of ice on the places I checked. Our harbor has 8" right now. This year there are 3 ice ridges. Most are small and can be gotten over easily. 3 or 4 humps are within 1/2 a mile of the resort. These are all accessible from the resort. Close to 3/4 of a mile out is a double ice ridge that is 2-3 feet high in places, and 4' in others. This runs from past Grassy Point towards Big Rock. On Sunday some 4 wheelers drove over from Stony Point & fished the humps out front. They found a way to get over somewhere. Right now there is a couple miles of fishable area out in front of Horseshoe Bay. View the Horseshoe Bay Lodge specials here. Fishing Report December 13, 2011 Jeff Sundin Ice fishing action is heating up in Northern Minnesota as weather conditions are rated perfect for making ice. There is virtually no snow in the area right now and with a solid base of good ice, even the relatively mild temperatures continue to make ice every day. Some lakes have as much as 11 inches of ice already, others lag behind, but there are dozens of lakes in the area where travel conditions are rated excellent. For me, another day of getting things organized, repaired and packed up and then I'll be heading out Late Wednesday for my first ice fishing trip of the season. I'll be planning on updating the report from our top secret, remote location. (12/13) On Lake Winnie, Kim from Highbanks Resort added that the Lake has been frozen over since Sunday, December 4th. Minimal snow cover has made conditions ideal for making ice!! On Monday 12-12, there were some ATV's with portables in tow on their way out to the Big Island area, roughly 4 miles out on the ice. That was the first activity that they've seen out on the main lake so far! High Banks Resort is offering a winter special, Stay two nights midweek, get the third night free! They will be open for cabin rentals beginning on New Years. (12/13) On Lake of the Woods, Jacki at Sportsmans Lodges says; "We have started our first official day with a very successful start. The walleyes and saugers are active! Check out these pictures! Anglers are seeing lots of nice sized walleyes and saugers of what some are calling “summer fish” since they are larger than the fish we normally catch in the winter. A report of two 5lbers and an 8lb walleye were caught and released. The ice froze incredibly clear and we still have no snow at this time. We are finding some dynamite fish just outside of Pine Island right now. Gold jigs and stop signs tipped with a shiner or chub minnow are working the best. In the areas we travel and fish, we currently have 12 inches of ice on Four Mile Bay and 10-12 inches on the lake. For those of you who are traveling on your own please watch for a few cracks that have come up since yesterdays warm up. This is common whenever the temperature changes. A day or so of warm temperatures throughout the winter is always a good thing as it helps to fuse the ice together and make for stronger ice. It sounds like this week's weather will be bringing us highs in the twenties and lows in the single digits. We will continue to be making ice daily! We may see some snow showers Wednesday or Thursday but it doesn't sound like it is going to bring us too much at this point. ATV's and light jeeps are the only vehicles advised for traveling on the lake at this time. The Rainy River is building ice daily but still is spotty with 3-10 inches being reported. We normally don't start using the river for travel until after the first of the year. Please remember the lake is not treated equally when it freezes so keep it safe. Check with local resorts and bait shops before venturing out. At this time we still have no snow. The land trails are closed. The lake trail to Pine Island as well as to various resort fish houses are marked at this time." (12/13) On Lake of the Woods, Mike at Wheelers Point Resort says; "Fishing the last couple of days has been fantastic. Lots and lots of nice fish are being caught, both walleyes and saugers. Our houses are located in 19 to 23 feet of water. Shiners have seemed to work better on the set lines while using a fathead head on your jigging lure. Most of the fishing area is in great condition with 9 to 10 inches of ice. Please check with your local resort or bait shop for ice conditions, as there are a couple of areas to avoid". 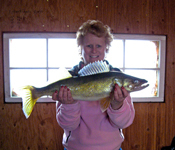 (12/13) On Bowstring Lake, Erin at Geiger's Trails End Resort said; "
The word on the ice is that there are Walleye in our lake! 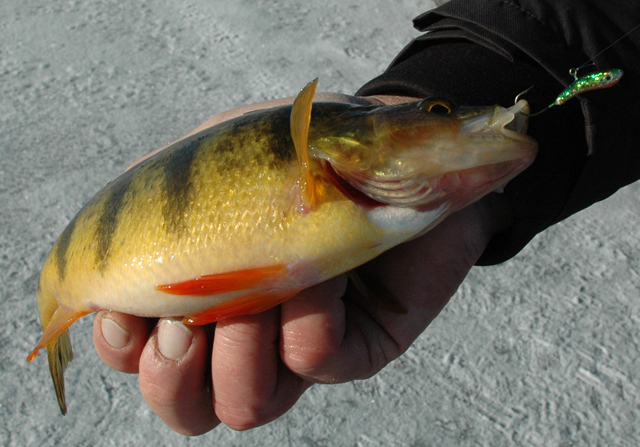 I have seen a few coming through the ice with a bunch of perch, too. Bowstring is still making GREAT ice. 11 inches so far with very little snow, Bring ice cleats, it's slippery out there!" (12/13) On Lake Winnie, John Seekon from The Pines Resort & Campground Told me that there have been a few anglers and some darkhouse anglers hitting the ice on the East side of Winnibigoshish. There are now ice thicknesses ranging from 8 to 10 inches on Tamarack Bay. Ice thickness of 8 to 10 inches, also present at the Third River Flowage on Winnie's Northwest corner. The South shore froze once and then broke up again, but there is now 5 to 6 inches of ice out to the breakline, thinner ice as you move further out into the lake. There have been a few people chasing walleyes going out from the Birches Landing, but John hadn't recieved any reports yet. There has been some talk about the rough ice conditions on the main lake, but when the resorts in these areas begin plowing their roads, they will go through, or around the rough ice making travel conditions better. Last weeks cold snap and the lack of snowfall has really helped jump-start lake ice conditions. (12/13) On Ball Club Lake, Gus Sheker from Gus' Place Resort says; "On Ball Club Lake, the South end of the lake usually freezes over about one week before the deep middle. 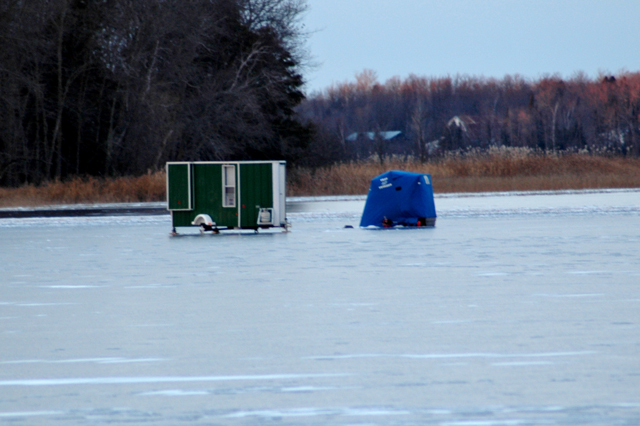 The South end of the lake has the thickest ice at around 6 inches and small ice houses are starting to be set out. In front of the resort the lake is much deeper with the ice at around 4 inches thick. 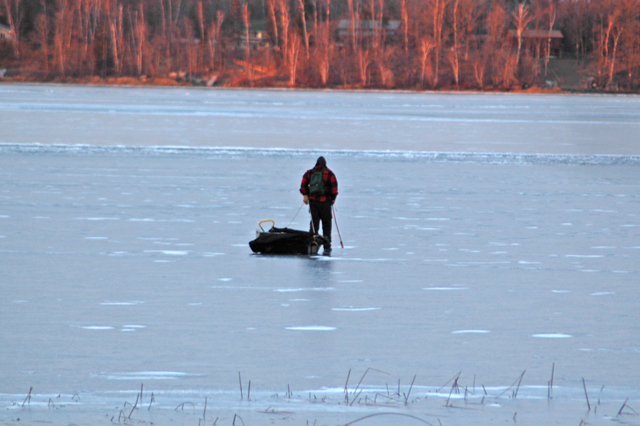 All ice fishermen should use extreme caution when venturing out on these bigger lakes, ice thickness varies. At this time foot travel is the only means we would recommend on our lake. There is little or no snow on the ice. Fishing reports are few at this time, but will be updated as the season moves forward. The photo contributor, photo of the week (12-13) goes to Greg Mansfield who captured the 49 inch, 33 pound whopper Pike >>> He caught it on Friday at Upper Red Lake. Greg was using 6 pound test and a medium action Ice Fishing Rod. (click the camera icon for larger image). 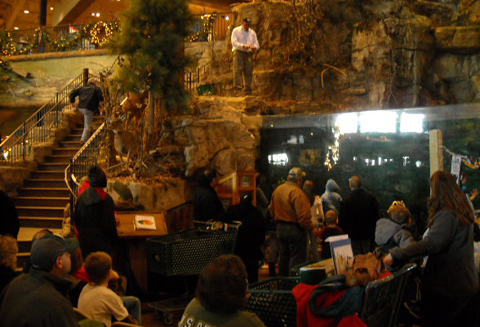 Fishing Report December 12, 2011 Jeff Sundin Thank you to everyone at the Bass Pro Shop Store in Rossford, OH for make my stay there enjoyable. I'm looking forward to my next trip and next time, I'm gonna get out and do some fishing while I'm there! The weather didn't change a lot during the four days that I was gone, but the ice conditions did! Most small lakes were frozen when I drove down to the Twin Cities on Thursday, but larger lakes like Thunder at Outing and Mille Lacs still had a lot of open water. By Sunday afternoon, the return trip from Minneapolis included ice shelter spottings on almost all of the lakes in the North Metro area. Lakes that I spied further North along Hwy 169 had at least a few shelters placed along every shoreline and by the time I reached Lake Mille Lacs, there were three or four dozen shelters on the shiny, new ice. For ice fishermen, it's a great time to polish your auger blades, top off your lure collection and get some fresh ice line on your reels. While you're at it, try dropping a hint that a few Darters or Slick Jigs might look nice in your Christmas stocking! For today, I'm going to get things organized and clear out a pile of paperwork. By Tuesday, I'll have a fishing update from many of my fishing buddies and Wendnesday, I'm scheduled to hit the ice myself for a few days. Later this week, the first hand reports will start rolling in! 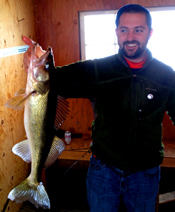 (12/12) On Lake of the Woods, Mike Kinsella at Border View Lodge says; " Early reports have been excellent. We’ve been fishing in 18 to 23 feet on the South shore. Lots of 14 to 19 inch walleyes are biting in the morning and late afternoon. Slot fish are being caught as well, with most in the 23 to 26 inch range. Saugers are available midday with nice ones mixed in with the smaller ones. While fish seem to be sticking to the bottom, the occasional fish will be suspended." "We currently have 10 inches of solid ice where we fish, but there are a few trouble spots around the lake. We encourage you to check ice conditions in your area before you head out and stay on designated or marked trails." Mike added that even with the warmer temperatures predicted for the week, ice should continue to form. One last note, If you're looking for a place to ice fish, early season on Lake of the Woods is pretty darn good and Border View still has some openings for this week and next. (12/12) On Bowstring Lake, Erin at Geiger's Trails End Resort says that there was 11 inches of ice on Sunday, She added; "Wooo Hooo! Bill has been out ALL weekend". (12/10) On Leech Lake, Ron at Anderson's Horseshoe Bay Lodge was reporting that Horseshoe Harbor had between 6-8 inches of ice. He said that he'd walked out on the main lake portion near Grassy Point and that it held hisweight. At that time, he was guessing it at about 4 inches of ice. 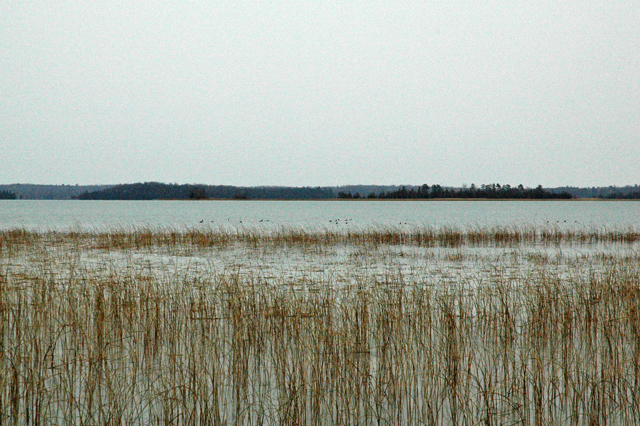 People were fishing Shingobee Bay towards the Walker side of Leech Lake. Ron had driven over the bay on Friday and someone was out in a portable at that time. He added that there were reports of ice thicknesses in the 5 to 6 inch range near Pine Point at that time. Ron is running a bunch of specials this winter too. View the Horseshoe Bay Lodge specials here. Fishing Report December 8, 2011 Jeff Sundin A tour of the area on Wednesday revealed plenty of ice and lots of anglers getting a jump on the weekend. There's going to be plenty of spots to try and if the weather holds, travel conditions are going to be way better than they were last year! Almost all of the area lakes are now ice-covered, even the deeper ones. Some of the deepest lakes have only been frozen since Tuesday, so they're not ready for travel, but without snow cover, ice will form fast. A bit of advice though, make sure you have your cleats, most area lakes do not have any snow cover and the ice is shiny and slick in a lot of spots. In general, anglers are catching fish, but the reports are still just beginning to trickle in. Best action has been reported by the dark house anglers who have found Northern Pike on the move. So far, no mention of any giants, but the action has been good and there are still a lot of popular areas that are untapped. Perch and Walleye fishing has been good too, but anglers have been depending on the shoreline areas within walking distance. I started seeing a few ATV's on local lakes yesterday and by this weekend, there will be plenty of places with enough ice to support them. Field Report December 7, 2011 Jeff Sundin Below zero temperatures have hurried the ice along and many Deer River area lakes are already seeing some fishing traffic. The largest, deepest lakes aren't quite ready for prime time, but if you've got the itch to do some ice fishing, you can find plenty of places to go this weekend. For now, I think it's a good idea to stick with the smaller lakes and I'd plan on hoofing it to the spots, but there are some fishermen already moving to and from their spots using ATV"s.
(12/07) On Ball Club Lake, Gus Sheker from Gus' Place Resort says; "The south end of the lake froze over to the "drop off" north, during the Thanksgiving week. Local fishermen are setting their spearing shacks up at this time! The main, deep body of the lake froze last night 12/6/11 and is NOT yet safe to venture out on, but this should improve during the coming week making it safe for foot travel." (12/07) On Bowstring Lake, We'll be seeing some new faces on the ice this winter. Geiger's Trails End Resort has new owners, Bill and Erin Charlton and is now open, with cabins available for winter fishing. According to Erin, the "ICE IS FANTASTIC! NO SLUSH this year with a light coating of snow! DNR reported, as of yesterday (12-6) , that there are 6 inches of ice. People are pulling out portables with 4 wheelers. (12/07) On Lake Winnie, John Seekon from The Pines Resort & Campground said; " We have ideal weather for some great ice production. Right now the entire lake is frozen over, with 6 to 7 inches of ice in most of tamarack bay and third river flowage. A few people have been out off plughat point , and are catching perch in 11 feet of water, As the ice thickens we will see more people venturing out and will have more reports." (12/07) On Lake Winnie, The Third River Flowage has about seven inches of ice and anglers have begun using ATV's for travel to their shelters. According to the folks at Dixon Lake Resort, spear fishing has been good, so far the largest Pike has been 13 pounds, but there are lots of reports about anglers getting limits. Dixon Lake Resort has dark houses available on the ice now. (12/07) On Cutfoot Sioux and Lake Winnie, Bryan Harris at Eagle Nest Lodge said that Cutfoot was finally ice covered for the first time on Tuesday morning. Weather appears to be playing right into their hands for making good ice in a hurry, but Bryan cautioned that it will still be at least a week before you can count on good ice for travel. (12/07) In the Marcell Area, Terry Schmitz at Frontier Sports reported "Fishing is just starting. We have had people out on Jessie and Bowstring, picking up a few walleyes in the evening. Some of our smaller area lakes have almost 6” on them. Heard reports about some crappies being caught. After last night of 9 below we should be good to go for this weekend." Frontier has a great special on Extreme Ice pop Up houses at 169.00, Reg 229.99. (12/07) On Jessie Lake, Tim and Rita Onaret at Jessive View Resort are getting ready for their first guests of the winter to arrive this weekend. Angling and spearing has begun on the south end of Big Jessie where there was already 6” or more of good ice south of a line that goes from the East side public access across to the resort. North of that line, open water persisted through last weekend, so there hasn't been anyone venturing toward the deeper area of the lake. Recent cold temperatures will accelerate the ice making on that end and by this weekend, anglers should be able to walk almost anywhere. Jessie View has cabin sizes range from 1 to 5 bedrooms and offer free upgrades to the big, newer cabins with satellite TV, 2 baths and fireplaces are common throughout the winter to groups of 4 or more. They guaranty new cabins for groups of 6 or more (subject to availability). Rates are affordable and they're near other great ice fishing lakes too! (12/07) On Lake of the Woods, Mike at Wheelers Point Resort says that Four Mile Bay has already been frozen for some time and anglers are travelling on the bay by ATV and Snowmobile. Rainy River is fishable in most places, with only a few exceptions. Fishing both up and down stream on the river has been good and Mike says that lots of fish are being caught. The main lake that had frozen once and re-opened, is now frozen again and has about 5 inches of ice (as of Tuesday). He's anticipating that with the cold temperatures forecasted, there should be around 7 inches this weekend which will put most resort houses on the lake. Finally, he added please be safe! Check with local resorts as there are always problem areas this time of year. (12/07) On Lake of the Woods, Jacki at Sportsmans Lodges says "The lake is pretty well sealed up. The crew checked this ice this afternoon and found 7-8 inches on the 4 mile Bay and 3-4 inches on the lake. They went out to about 15' of water outside of Pine Island. It is currently 12 below as I type this and we are looking forward to cool temperatures all week. We plan to make the final decision on Wednesday to start on Saturday or not after we see how fast we make ice in the next two days. Please remember the entire lake is not treated equally and this report is based on the areas we travel and fish in the early season. Stay tuned!" Field Report December 5, 2011 Jeff Sundin Before getting started, a heads up about Red Lake, last week there were guys fishing the lake's South end when the wind blew a chunk of ice, with them on it, out to sea. It's probably not going to take long before the lake freezes solid again, but before you go out, be sure to check the exact area you plan to fish. It was a busy weekend at the St. Paul Ice Show! Conditions were perfect to draw a big crowd. Anglers are just starting to fish on the smaller, Twin Cities Metro area lakes, larger lakes are not ready yet, but they're getting close enough to give everyone the itch. That, combined with the airing of ice fishing programs on television, got folks heading for the show to find the deals and get stocked up for the season. I was working at the Lindy display, where we didn't have much time for wandering around. But, there was enough time to sniff out a few really interesting items around the show. For me, the old ice suit I've been using is in tatters and I had one priority, to find a good ice suit for fishing this winter. I looked at everything in the show and I think that the best one, by far, is going to be the Arctic Armor Suit. It's light weight, water proof and rugged, but best of all, it provides 100% flotation. In other words, if I happen to be hoofing it to my favorite ice fishing spot and break through thin ice, I might get a little embarrassed, BUT I WON'T DROWN! That sounds like a heck of a good deal to me, even if it costs a little extra. I have to order mine this week to get the cool color that I want, but I'm guessing that you'll be hearing more about it once it arrives. While I was at the show, there were several people telling me stories about places where they had already been ice fishing a time or two. Even though the larger lakes are still open, anglers are finding a bunch of smaller lakes where the ice is thick enough to fish. Now that I'm home, I'll be getting reports today and have an update ready for Tuesday morning and some more for Wednesday. Field Report December 2, 2011 Jeff Sundin On Thursdays during the Deer Hunting season, I usually sit a little closer to the edge of my seat. There's just something about that day of the week, it's getting to be my scheduled day to see a buck. I saw one yesterday, a nice six pointer, but my first impulse was to let it walk. Then I started thinking, gonna be gone this weekend, gonna be gone next weekend, gonna be busy in between ... BANG! I guess I shouldn't have done that, at first he dropped right on the spot, but after a few seconds, he shook himself up and started heading for the swamp, not a little swamp, THE SWAMP! So, after an hour and a half of tracking him last night, I'm headed back out there this morning to see if I can pick up where I left off. On my way up there, I'll be stopping to snap a few more pictures of nearby area lakes, and I'll add a few last minute notes to the report before heading for the Ice Show in St. Paul. From the show, I'll be updating the report with interesting people and things that I spot at the show. Of course, you are more than welcome to stop by and see me! I'll be at the Lindy Booth all day long on Saturday and Sunday. Field Report December 1, 2011 Jeff Sundin On Wednesday, the calendar started catching up with the lakes in the Itasca Area. 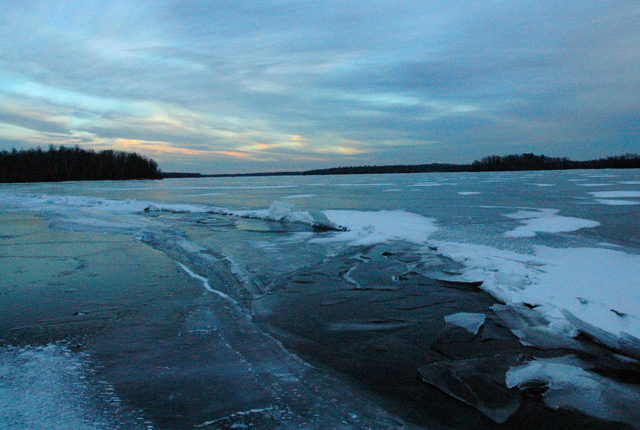 In spite of the relatively mild weather, winter has begun to get a grip on some of the larger and deeper lakes in the Grand Rapids, Deer River area. On my way to the Deer stand on Wednesday, I took the back roads so that I could check the progress of a few nearby lakes. Honestly, I was surprised when I saw that Chase Lake had skimmed over with ice, but it has and that marks the beginning of the deeper waters freezing up. Seeing ice on Chase Lake, piqued my interest, so I took the back road over to Deer Lake to check it out. For now, it's mostly wide open, but the shallow water is starting to freeze there too. Once the ice has a foothold, it won't be long before that one skims over too. One more stop for me at a smaller, shallower lake that's been frozen for a week or more already. Here, I was able to walk out without hearing even the slightest hint of cracking or groaning. I'd guess that there are some more small lakes in the area just like this one. In other words, if you're chompin' at the bit to go ice fishing, you can probably find a spot for this weekend. If you do, please be really careful, because you're the only reader I've got and I don't want to lose my audience, OKAY? On Saturday and Sunday December 3rd and 4th, 2011, I'll be at the St. Paul Ice Fishing Show. You'll be able to find me most any time, both days at the Lindy Booth. (12/01) On Red Lake, My buddy, Jonny Petrowske (Outdoors With Jonny P) walked on his tip-toes from the shoreline at Hillmans and found some nice Walleyes. On Tuesday, there was about 3 to 4 inches of ice, so for now, don't plan on going up there unless you plan on hoofing it. The ice, especially close to shore will be forming fast now and if we manage to avoid a major snowfall, conditions could be really good in just another week. Remember, on Red Lake, today marks the return of the seasonal 17 to 26 inch protected Walleye Slot Limit. You can have 4 fish, under 17 inches, or if you're really lucky, 3 under 17 and 1 over 26 inches. 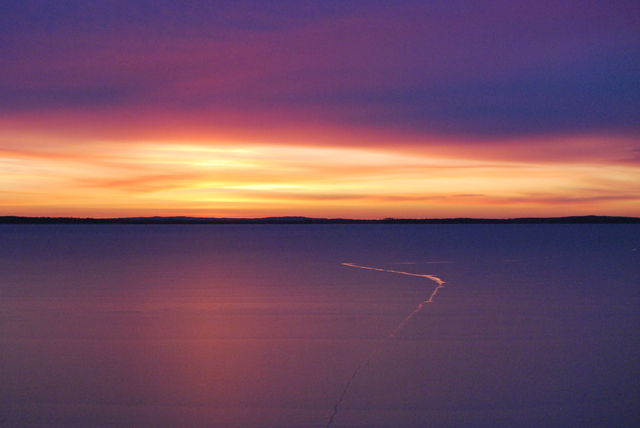 (12/1) Bemidji Lakes Area and NMLOG Member, Paul A. Nelson, Bemidji Area Lakes Guide Service says; Many of the shallow lakes in the Bemidji area have frozen-over, but most of the deep lakes still have open water. 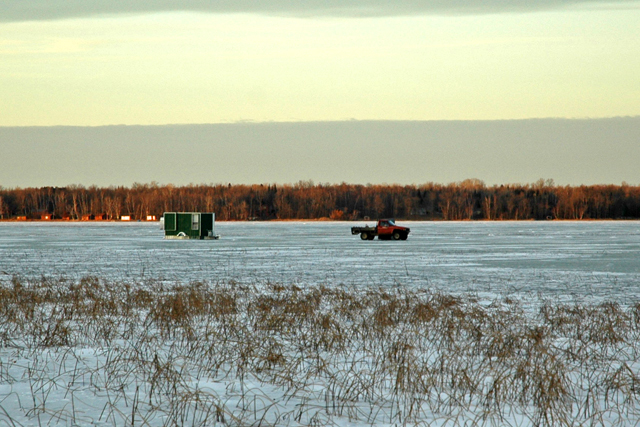 There were anglers fishing out of their boats on Lake Bemidji this past week, which is usually one of the last lakes in the area to freeze. 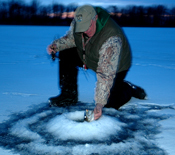 The first lakes to have ice fishing in the Bemidji area are usually Upper Red Lake and Lake of the Woods, which are both located north of Bemidji. Anglers have been walking out to the shoreline break on 4-6 inches of ice on the east and north shores of Upper Red Lake and the south shore of Lake of the Woods. Some of the local lakes that are good early ice lakes include Irving, Three Island, Midge, Gull, Grace, Blackduck and Cutfoot Sioux. The bait stores usually have the most up to date information on the ice conditions because they are talking to the anglers on their way to the lakes. Anglers should take the normal precautions on early ice, especially when traveling in new areas that haven’t been tested. Safety items include a boat cushion tied to a rope, ice picks and a life jacket. Anglers should test the ice conditions personally by striking the ice with a chisel or by drilling holes until a “safe” path has been established. You don't have to catch a ton of fish to earn a smile. Arne Danielson lifts his spirits by slipping a 5 pound Walleye out from under the ice. On Dec. 29, there was open water from Rydberg Bay, North toward Coleraine. Click image to Enlarge. Ice thicknesses on most of Northern Minnesota's lake range from 10 to 16 inches. Even deeper, late-freezing lakes are beginning to see light vehicle traffic. This pesky ice ridge blocked us from our spot on Wednesday, don't worry though, we'll get even next time. Yes, that's open water! A day with my daughter in a nice roaster toasty warm shelter, add enough Perch action to keep it intersting and you have a little slice of heaven! Austin's nice, "eater" Walleye caught at mid-day helped us focus on a location to set up the ice shelter. Courtesy Sportsman's Lodge: How could you hold that one without smiling? Lake of the Woods has been on fire for the early ice season! 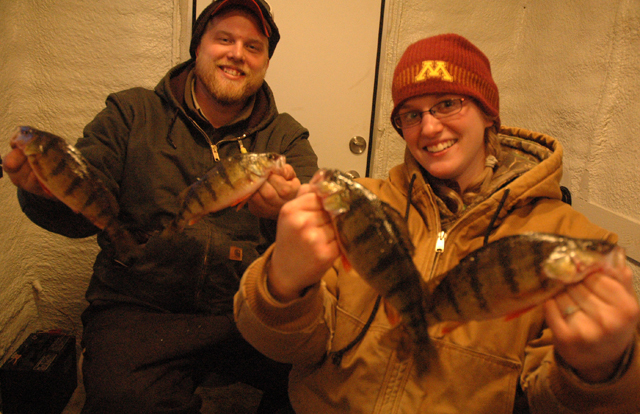 When you're ready for some action and a great fish fry, Jumbo Perch fishing is always a great plan. Fish the Slick Jig with a whole minnow. This might be the perfect "injured minnow bait". Arne Danielson fished along the outside edges of weeds in about 9 feet of water. The early action started with a Techni-Glo, Perch Pattern Rattl'n Flyer Spoon. Later, the Slick Jig kicked into high gear! Courtesy Sportman's Lodges. Annette Gustafson shows off a great looking Lake of the Woods Walleye. Fishing action has been great on LOW! A great first effort for Wayne Crandall! Cutfoot Sioux for Crappies (top) and Lake MilleLacs (bottom) for Walleyes, all in the same weekend. Great early season ice conditions make this a perfect time to hunt for Quality Sunfish, Cover some ground now, while you still can. Sunday afternoon, I spotted my first truck on the ice while I was out hunting for some good pictures. 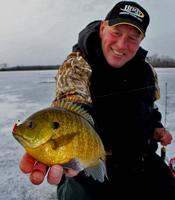 Ice quality is good and ice fishermen are finding their way to the best panfish action. Lindy's 1/16 ounce Slick Jig tipped with a whole minnow attracted larger size Perch. Click Image for larger view. Courtesy Greg Mansfield. This 49 inch, 33 pound whopper Pike was caught Friday on Red Lake using 6 pound test and a medium action Ice Fishing Rod. 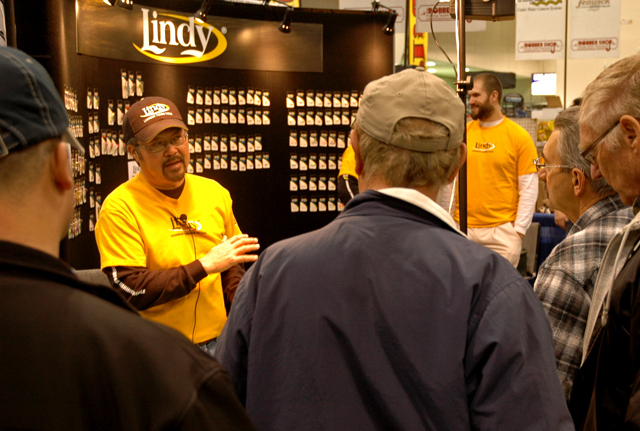 Sundin demostates Lindy's Darter at the Bass Pro Shop ice fishing event over the weekend. By the time I drove around this Deer River area lake, I'd already spotted a half dozen ice fishermen. Larger houses are starting to show up too. There are anglers using ATV's on some lakes already. Courtesy Geiger's Trails End Resort. Bowstring Lake iced over on 12-5-2011. Ice fishing this weekend? Maybe! Lindy's Ted Takasaki teaches anglers how to trigger Walleyes using the Lindy Darter. He's in there somewhere, and I'm goin' in! Jonny Petrowske, (Outdoors With Jonny P), snuck out on Red Lake and picked up a nice limit of Walleyes. So far, hoofing it is the only way to go, but ice is making fast on the giant lake. Deer Lake, still open and still home for some ducks as of December 1st. Courtesy Nick Perkkio. Nick has a brand new ice shelter built and ready to park on Lake Winnie. Now, just add ice!